Dianne Volek is the owner of InterComm SA e-Learning Solutions. InterComm builds intranets that empower communication between management and employees, and extranets that share information between companies and their clients or suppliers. I create content for e-Learning systems, and a major limitation is that PowerPoint slides cannot be embedded (Microsoft is proprietary software). PPS files need to be downloaded, which isn’t user-friendly, trackable or secure. I struggled through forums for days to find a solution for embedding Powerpoint into Moodle! I tried a dozen other methods and software, and iSpring is the one that works. Moodle course creators have traditionally had to use Slideshare or Google Docs to convert PowerPoint to HTML5, but iSpring doesn’t compromise intellectual property security or require internet access. The price of the software is very reasonable for the functionality (it is only high due to my country’s exchange rate). The software is so intuitive, it doesn’t need explaining. The lecturers like iSpring because they know and use PowerPoint already for lectures. The LMS staff and programmers like it because they don’t have to mess with the lecturers’ content. Conversions can be done in minutes into one of five options — programmed HTML5 takes days and is often unstable on mobile. Although iSpring Converter for video is good, video as a format has issues. We have regional differences: even though only 1 of 30 slides is different, we have to create and load a dozen different videos each time the lecturer makes a change. The export function looks very useful (I don’t know how often I have lost files before), as does the resources and presenters section. I didn’t have time to explore all the functions. But the client, lecturers and students all agreed the end result was professional. Quickly create eLearning content for employee onboarding, product training, and assessment. 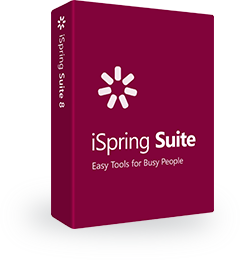 © 2001-2019 iSpring Solutions, Inc. All rights reserved.